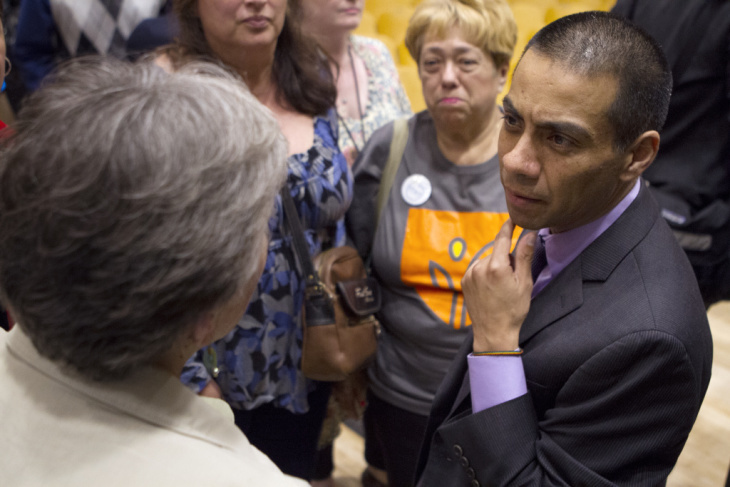 Embattled LAUSD Board Member Ref Rodriguez Close To Reaching A Deal On Campaign Finance Questions. Here's How We Got Here. Ref Rodriguez is having a bad year. He was charged with three felonies. He's at the center of a separate financial scandal. He has faced regular, repeated calls to resign from the Los Angeles Unified School Board. He's already given up the board's presidency. And on Friday, Rodriguez and his cousin Elizabeth Melendrez appeared ready to admit that they had done what they've been accused of doing — urging 25 friends and family members to donate to Rodriguez's 2015 election campaign and then reimbursing the donations. The admission would come as part of a proposed settlement with the L.A. City Ethics Commission announced Friday. If commission members vote to approve the settlement Monday, Rodriguez and Melendrez would pay a fine of $100,000. Rodriguez is still due in court on Monday for a preliminary hearing for the criminal case against him related to the alleged money laundering. The Ethics Commission's posting says that Rodriguez hopes to enter into a "global resolution" with the district attorney's office as well, but does not outline a possible plea deal for the criminal charges. There's been a lot to track as Rodriguez's bad year has unfolded. We put together this guide to help you catch up. PROLOGUE: WHO IS REF RODRIGUEZ? Rodriguez also started a non-profit "social venture investment fund," Partners for Developing Futures, to help finance educators of color looking to open charter schools. In 2015, Rodriguez ousted incumbent Bennett Kayser for a seat on the L.A. Unified School Board. His district represents two clusters of communities north and southeast of downtown L.A.: from Los Feliz to Eagle Rock, and from Vernon to South Gate. HOW DID RODRIGUEZ END UP IN CRIMINAL TROUBLE? This part of the story starts more than three years ago with a $26,000 check. On December 19, 2014, as his campaign for the L.A. Unified School Board was just getting off the ground, Rodriguez cashed out what prosecutors described as a "$26,000 business investment. According to prosecutors, Rodriguez and his cousin, Elizabeth Melendrez, then urged 25 other family members and friends to donate to his campaign on the promise they'd be paid back. Rodriguez and Melendrez allegedly used the $26,000 to reimburse these straw donors. Prosecutors argue that amounts to "political money laundering," which is illegal. HOW DID THEY (ALLEGEDLY) PULL THIS OFF? Prosecutors and city ethics officials said Rodriguez and Melendrez took steps to cover their tracks. Rather than handing out the $26,000 themselves, Rodriguez and Melendrez allegedly laundered the money through Rodriguez's parents' bank account. Prosecutors said Rodriguez's mother signed 16 checks — at Melendrez's direction — dividing up most of the $26,000 to reimburse the 25 donors. When Rodriguez's campaign reported its list of donors, it did not show a $26,000 gift from Rodriguez himself. Instead, the report showed 25 donations from family and friends — totaling $24,250 — that prosecutors and L.A. City Ethics Commission officials say really came from Rodriguez. WHY MIGHT ANY OF THAT BE AGAINST THE LAW? In short, prosecutors say Rodriguez is lying on official campaign finance reports, and you can't lie on your official campaign finance reports. After all, the $24,250 contributed to Rodriguez's campaign came from him, not those straw donors — as the campaign filings say. L.A.'s city charter is also pretty clear in its prohibition of making a donation in someone else's name or of making a contribution with money that isn't yours. But what's strange is that the city charter is also clear on another point: school board candidates can contribute as much money as they like to their own campaigns. That means if Rodriguez had simply dumped the money from that $26,000 investment into his campaign coffers, we probably wouldn't be here right now. SO WHY WOULD RODRIGUEZ DO THIS? We don't know for sure; Rodriguez and his attorneys have refused multiple interview requests. Here's one theory: early fundraising totals are often a strong indicator of a school board candidate's viability. Remember, all of this allegedly happened in mid-to-late December 2014, just weeks into the campaign, and just days before candidates had to report their year-end finances. At the time, the extra $24,250 was a big deal — it doubled what Rodriguez's campaign had in the bank up to that point. The donations also helped Rodriguez catch up to another candidate who had been leading the fundraising race. AND IT TOOK THREE YEARS FOR ALL THIS TO COME TO LIGHT? Well, reporters from certain news organizations — ahem, ahem... KPCC — were actually asking questions about Rodriguez's campaign finances way back when. In 2015, we noticed that several of the contributions to Rodriguez's campaign came from employees at his charter school network, PUC Schools. These were gifts approaching the maximum $1,100 allowed, coming in some cases from janitors and office clerks. In 2015, KPCC reporter Adolfo Guzman-Lopez asked PUC Schools office worker Luz Maria Lopez whether she was reimbursed for her $900 gift to Rodriguez's campaign. No, she replied, "It's a donation. How are you going to get reimbursed?" Rodriguez, too, said in 2015 that these early donations were neither coerced nor reimbursed. "It's been sort of an outpouring of folks' belief in me," he told KPCC in 2015. But it apparently didn't take long for the city's campaign finance watchdog to take notice either. When the charges came down in September 2017, Rodriguez issued a statement saying he and his lawyers had been negotiating with the L.A. City Ethics Commission for two years "to resolve these issues." COULD RODRIGUEZ GO TO JAIL? Yes, it's possible — he faces felony charges. So does his cousin, Melendrez. On September 13, 2017, prosecutors charged Melendrez and Rodriguez with one count each of conspiracy. Additionally, Rodriguez faces one count of perjury and one count of "offering a false or forged instrument" — essentially, filing a false campaign document. He and his cousin also face 25 misdemeanor counts for each one of the reimbursed donations. Both Melendrez and Rodriguez have pleaded "not guilty." WHAT IS THIS SECOND RODRIGUEZ SCANDAL ALL ABOUT? One month after the prosecutor unveiled the criminal charges, another round of bad headlines hit for Rodriguez. On Oct. 19, 2017, The Los Angeles Times reported PUC Schools — the charter school network Rodriguez had co-founded — had filed a formal "conflict of interest" complaint against him with a state ethics agency. Was Rodriguez "self-dealing?" That is, did Rodriguez take more than $285,000 the charter school network's money — public money, taxpayer money — to enrich businesses in which he had a personal stake? Or was Rodriguez simply paying back vendors who had offered legitimate services to the school? The answer, even now, is by no means clear. WHAT EVIDENCE DID PUC SCHOOLS PROVIDE TO SUPPORT THEIR COMPLAINT? The evidence: more checks — 16 of them, all signed by Rodriguez between March and October 2014. These checks drew funds out of PUC Schools accounts and sending them to two businesses to which Rodriguez was also tied. Fourteen of the checks, totaling about $265,000, went to Partners for Developing Futures — that's the "social venture investment fund" that Rodriguez founded to help finance start-up charter schools. Two of the checks, totaling $20,400, went to Better 4 You Fundraising — a company that appears to have helped schools raise money. Rodriguez, at least at one point, had been an investor in Better 4 You Fundraising. It's hard to definitively say. For instance, Rodriguez was still formally listed as the CEO of Partners for Developing Futures at the time of the payments, meaning he would've been on both ends of that transaction. Or, were they? Partners for Developing Futures had agreed to create a training program for the charter school network in 2012, but PUC Schools' conflict-of-interest complaint said Partners for Developing Futures did not follow through on the contract until 2014. A spokesperson has said PUC Schools is still investigating whether any training program was ever delivered as a result of that contract. When asked about the conflict-of-interest complaint, Rodriguez's attorney declined to answer specific questions but said Rodriguez denied doing anything wrong. WHAT ABOUT THE PAYMENTS TO BETTER 4 YOU FUNDRAISING? Well, you're already this far down the rabbit hole — might as well come a little further down, because there are even more confusing questions about his payments to Better 4 You Fundraising. Rodriguez's public filings tell two very different stories about his relationship to Better 4 You Fundraising during this period. When he launched his candidacy for the L.A. Unified School Board in November 2014 — months after he authorized the last payment to Better 4 You Fundraising — Rodriguez listed Better 4 You Fundraising as an investment on his formal financial disclosure form. Rodriguez has subsequently confirmed to KPCC that he did, in fact, have an investment in Better 4 You Fundraising in November 2014. But would PUC Schools leaders have known that at the time? 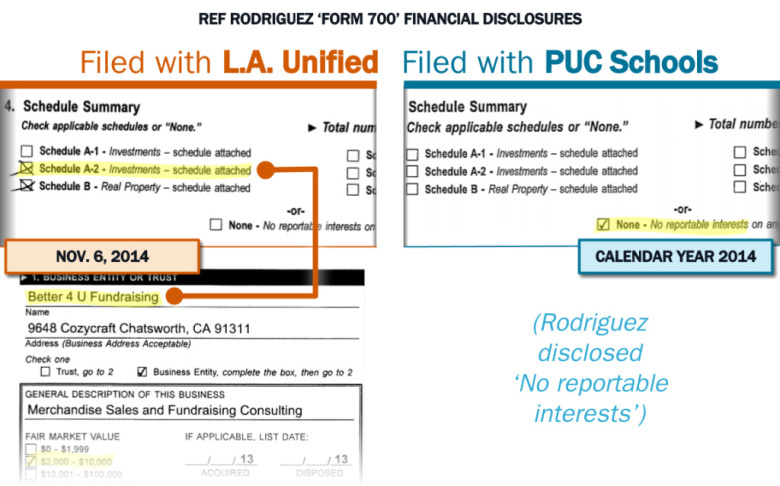 KPCC learned Rodriguez filed another version of his 2014 financial disclosure forms with PUC Schools — and this version makes no mention of Better 4 You Fundraising, even though it covers almost the exact same period of time. WHY DOES THE DISCREPANCY MATTER? Remember, this is public money that was paid out here — it matters whether that money was spent for legitimate purposes. It's not clear whether Rodriguez's omission of Better 4 You Fundraising on that second form was intentional or simply a mistake. But either way, without that information, could PUC Schools have taken steps to avoid, if not actual conflicts of interest, then perceived conflicts of interest, between Rodriguez and these outside entities? L.A. Unified regulators have argued PUC Schools should've known about these conflicts anyway. 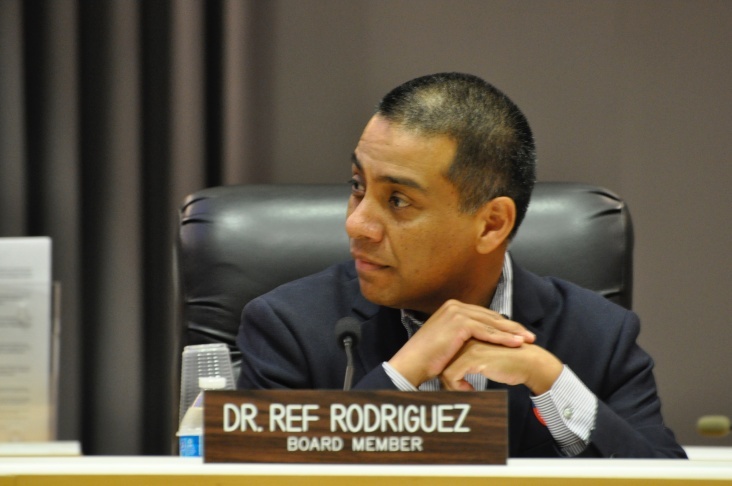 School district officials said they were raising red flags with PUC Schools about Rodriguez's links to Better 4 You Fundraising and Partners for Developing Futures as far back as 2015. In a way, PUC Schools has been left holding the bag. LAUSD has now been aggressively seeking answers from PUC Schools about why they investigate Rodriguez's payments earlier. The charter could face serious consequences if they can't satisfactorily answer LAUSD's questions. At one point, PUC leaders publicly begged their co-founder to break his public silence about the scandal. "Now, more than ever, [Rodriguez] needs to explain these transactions, where the payments went and how they could have possibly benefitted the schools," PUC officials wrote in a letter to L.A. Unified. "Only Dr. Rodriguez can shed light on the documentation PUC Schools has uncovered." DOES RODRIGUEZ FACE CRIMINAL CHARGES FOR ANY OF THIS? No. He only faces criminal charges for the campaign finance matters. The conflict-of-interest complaint was dismissed very quickly after PUC Schools filed it in October 2017. The state's Fair Political Practices Commission, the ethics agency that handles these complaints, sometimes chooses not to investigate these matters when the subject already faces the possibility of bigger consequences, like criminal charges, even if the cases aren't directly related. WHAT'S THE NEXT STEP IN THE CRIMINAL CASE? After months of delays, Rodriguez and Melendrez are set to appear in L.A. Superior Court on Mon., July 23, for their preliminary hearing. At the hearing, prosecutors have to establish that they have enough evidence to support the charges they've brought. In doing so, it's possible the public may get sneak peaks at the cases both sides plan to mount in the event of an actual trial. We also may get some answers to questions that are still unanswered: for example, what is the $26,000 "business investment" that Rodriguez cashed out? Was the $26,000 "business investment" tied somehow to either of the entities in the conflict-of-interest case, like Better 4 You Fundraising or Partners for Developing Futures? But many observers wonder whether this case will ultimately go to trial at all. Many have speculated Rodriguez could cut a plea deal in which he could resign his school board seat in exchange for avoiding jail time. WHAT HAS RODRIGUEZ BEEN DOING AS THIS ALL PLAYS OUT? 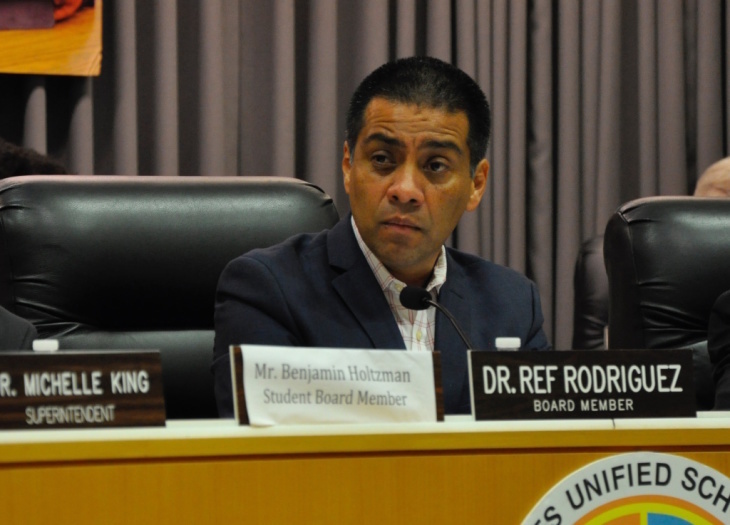 Rodriguez gave up the presidency of the L.A. Unified School Board not long after charges were filed. The bad publicity has left Rodriguez's political standing greatly diminished. But he has ignored calls — mostly from teachers union activists and other political opponents — to resign from the board altogether. In the meantime, Rodriguez has cast some important votes — including one in favor of hiring new LAUSD superintendent Austin Beutner. Rodriguez was also arrested for public drunkenness Pasadena in March, the L.A. Times reported. According to KCBS-TV, which obtained police body cam video of Rodriguez's arrest, was not charged. LAUSD board member Ref Rodriguez is accused of lying on important campaign finance reports from 2015. He faces the possibility of prison time if convicted. The charter school he ran also raised the possibility that Rodriguez was self-dealing with public money. But there are many unanswered questions, and in any event, Rodriguez does not face criminal charges in the conflict-of-interest matter. On both counts, Rodriguez has denied wrongdoing.